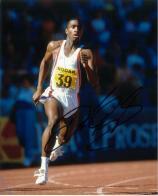 Derek Anthony Redmond (born 3 September 1965, in Bletchley, Buckinghamshire, England) is a retired British athlete. During his career, he held the British record for the 400 metres sprint, and won gold medals in the 4x400 metres relay at the World Championships, European Championships and Commonwealth Games. However, his career was blighted by a series of injuries, and he is best remembered for his performance at the 1992 Olympic Games in Barcelona where he tore his hamstring in the 400 metres semi-final but fought through the pain and, with assistance from his father, managed to complete a full lap of the track as the crowd gave him a standing ovation. The incident has become a well-remembered moment in Olympic history, having been the subject of one of the International Olympic Committee's 'Celebrate Humanity' videos and been used in advertisements by Visa as an illustration of the Olympic spirit and featured in Nike's "Courage" commercials in 2008.